We have three really great build’s in this issue! Norman Sterner shows us how he scratchbuilt his amazing, big scale, Supermodified! Three modelers join forces to build a replica of Bill Burnham’s famous, “Old Blue” ’29 roadster. Then John Teresi returns with a step by step on building a replica of a friend’s ’30 Gasser coupe. 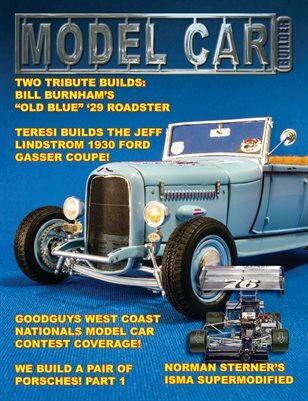 Plus, coverage of the Goodguys West Coast Nationals Model Car Contest, and a look at next issue’s project!